Tafoni are ellipsoidal, pan- to bowl-shaped, natural rock cavities. These cavernous weathering features include tiny pits, softball-sized cavities, truck-sized caves, and nested and cellular honeycomb forms. Tafoni typically develop on inclined or vertical surfaces and occur in groups. These exquisite and fascinating cavernous weathering landforms are present on the surfaces of many different kinds of rocks located in a multitude of geographic regions around the world. Since the late 1800s, more than 100 research articles have been published in numerous languages on this geomorphic topic. Tafoni development and evolution is puzzling and continues to arouse curiosity (see References: Blackwelder, 1929; Boxerman, 2006; Hejl, 2005; Pestrong, 1988; Smith, 1982). Tafoni-like features comprise a class of relatively deep, rounded to elongated natural rock cavities bored primarily by rock weathering processes and secondarily by erosional processes. In the geological literature, the distinction between cavernous weathering features is muddled. I think tafoni structures include: small tafoni, pits, hollows, niches, recesses, alcoves, alveoles, alveolar weathering pits, gnammas (? ), stone fretting, fretwork, recesses, honeycomb, and honeycomb weathering. Geomorphologists point to salt weathering, differential weathering processes, lithologic variation, and micro-climates, as important factors on the development of these cave-like rock structures. On geologic time-scales, tafoni cause rapid coastal landscape retreat, while desert landscapes retreat more slowly. 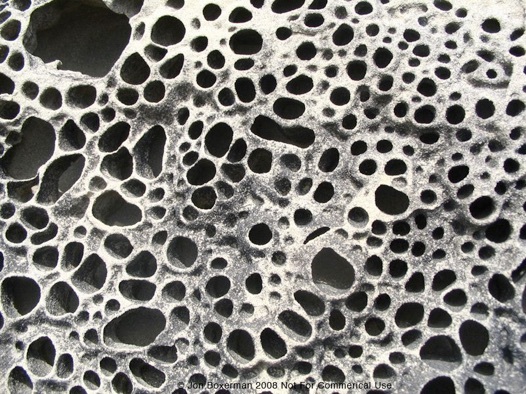 Gill, Segnit, and McNeil (1981) estimate that tafoni weathering processes cause 10 percent of all coastal retreat. On human time-scales, tafoni destroys important stone monuments and sea walls. See these time-series photographs for evidence of change. Researchers study the tafoni rock weathering phenomenon to learn how to prevent or slow the decay of important stone structures, to better understand how climate shapes the land, and to discover more about this exquisite pattern in nature.